• Track the past: Using nothing more than a pen and paper, create a clear and comprehensive record of your thoughts. • Order the present: Find daily calm by tackling your to-do list in a more mindful, systematic, and productive way. • Design the future: Transform your vague curiosities into meaningful goals, and then break those goals into manageable action steps that lead to big change. Carroll wrote this book for frustrated list-makers, overwhelmed multitaskers, and creatives who need some structure. Whether you’ve used a Bullet Journal for years or have never seen one before, The Bullet Journal Method will help you go from passenger to pilot of your own life. I love bullet journaling and planning and have been consistent with a bullet journal for a few years now. It really, truly has changed my life. I know that sounds a little out there, but it’s so beneficial to have your thoughts written down on paper. When I saw this audiobook on Scribd, I immediately started listening to it because I wanted to know how the lovely system of the bullet journal came into fruition. 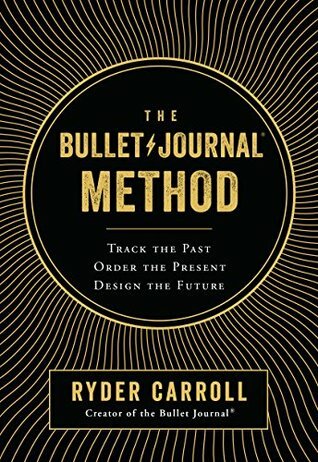 If you don’t know, the bullet journal is a system created by Ryder Carroll that replaces a rigid planner system. You add only what you need, and don’t even pause to think about the wasted space in your current planner. Ryder Carroll’s story behind coming up with the idea made me appreciate it’s flexibility so much more. He is a smart, motivated, and determined individual, but didn’t thrive in a school setting. I feel like I relate to this because I believe myself to be motivated and determined, but have to work extremely hard in school to get the grades I expect of myself. So, learning how he came up with this to help himself through his life was interesting to hear about. Planning is one of the ways I’ve learned to cope with my anxiety. I despise the unknown and can’t sleep at night *literally* if I don’t know what I’m doing the next day. (In my everyday life. Traveling is a whole different story.) I fill out my daily page for my bullet journal every single morning while I’m drinking my coffee or tea just so then I know what I need to accomplish or work on in the day. This has been so beneficial to me and my mental health! I love looking at the super fancy, beautifully decorated bullet journals, but that is totally not achievable for me. I LOVE being artistic and expressing myself through art, but I don’t want to spend 2 hours creating something that I probably won’t look at too much in the future. My bullet journal method is simple and straightforward. I have my index, future log, monthly logs, and daily logs. I do the bare minimum, but it still totally works for me. It’s a magical system because it’s so customizable. The first section of this book was about the actual bullet journal itself. Opening a new journal, creating your index and key. The whole shebang. But the second part of the book is what really stood out to me. It was the idea and methodology behind putting the journal into practice for you. I loved that they way things were explained was in a way to give you ideas, but not put you down for not wanting to use some of them. For example: I remember when I was in elementary and middle school, I never really remembered when my mom would get home from work that day. My brother and I rode the bus home from school, but because my mom was working in a salon, she created her own schedule. She could be home at 4:00 one day, and not back until 9:30 the next. Just thinking back, it would have been so beneficial to have a family “catch-all” system where we could write down where we would be at a given time. Something similar to this is mentioned in this book. I strongly believe that bullet journaling can benefit many people and can help in a variety of ways. If you haven’t tried bullet journaling, pick up this book and see if it could work for you!